Outside Lands is going BIG for its 10th anniversary. The three-day music festival returns to Golden Gate Park this August with a lineup for the ages, headlined by Metallica, The Who and Gorillaz. 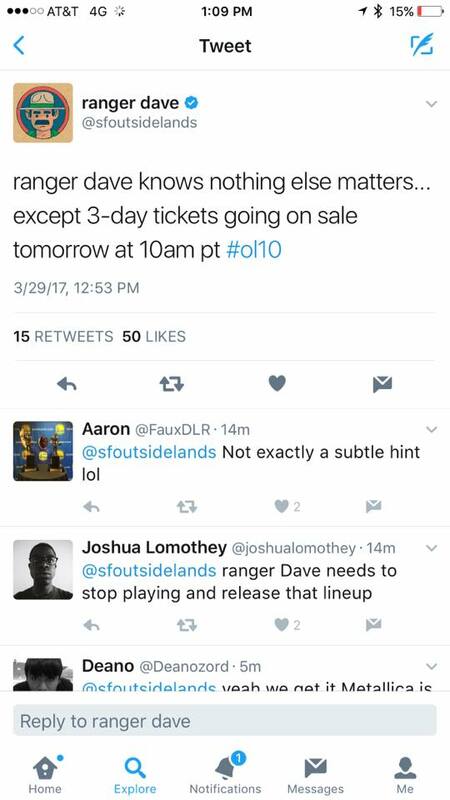 All three headliners were mentioned among our OSL predictions this year, with Metallica pretty much becoming a sure bet last week after Ranger Dave’s not-so-subtle tweet. Natives of the Bay, Metallica have been on the road in support of their 10th LP Hardwired… to Self-Destruct, and their headlining set at Outside Lands will come toward the tail end of their North American tour during a string of West Coast shows. The Who, on the other hand, have only a limited number of 2017 gigs planned right now, culminating with a six-night residency in Las Vegas that concludes on Friday, August 11th. With that said, we know then that Roger Daltrey, Pete Townshend and company will perform at OSL on Saturday or Sunday, with the latter being all the more likely. The festival, after all, has been known to schedule its “older” headliners for the Sunday night slot a la Lionel Ritchie (2016), Elton John (2015), Tom Petty (2014), Paul McCartney (2013) and Stevie Wonder (2012), and we expect The Who to get the same kind of treatment in 2017. But for Gorillaz fans in the U.S., Outside Lands could be the one place to see the band perform this summer. The festival is one of two North American dates for the Damon Albarn-led group, which headlines its own Demon Dayz Festival in June before making a stop at Festival d’été de Québec in Quebec City a month later. The same could even be said for sub-headliner Queens of the Stone Age, considering that OSL is their first scheduled North American show this year. The same, however, definitely can’t be said for Lorde, who is making the festival rounds with Coachella, JazzFest, Governor’s Ball, FPSF, Bonnaroo, Glastonbury, Rock Werchter, OpenAir St. Gallen, Fuji Rock, Lollapalooza, Osheaga and now OSL all on her current tour schedule. Other standout acts lined up for OSL this year include A Tribe Called Quest, alt-J, Above & Beyond, Fleet Foxes, Empire of the Sun, The Avett Brothers, Belle and Sebastian, Solange, Future Islands, ScHoolboy Q, Young the Giant, Rebelution, Vance Joy, Tove Lo, Bleachers, Little Dragon, Kaytranada, Action Bronson, Sleigh Bells, Royal Blood, Shovels & Rope, Dr. Octagon, Louis the Child, Thundercat, Dawes, Warpaint, Rag’n’Bone Man, Bomba Estéreo, Temples, Real Estate, RAC, James Vincent McMorrow, K.Flay, MUNA, Hamilton Leithauser, Sofi Tukker, Maggie Rogers, Foxygen, Goldroom, SOHN, Electric Guest, How to Dress Well, Hundred Waters, Noname and many more. Check out the poster above for the rest of this year’s bill. Boasting six consecutive sellouts to date, Outside Lands is sure to do the same in 2017 and will once again include a full lineup of comedy performances in addition to its famed Beer Lands, Wine Lands and Choco Lands + Cheese Lands. Of course, you’d have a tough time finding much better food and drink at a music festival than what Outside Lands offers. If you missed out on Eager Beaver tickets last Thursday, you can buy Outside Lands tickets starting this Thursday, April 6th at 10 a.m. It’s worth mentioning, though, that with the new lineup also comes increased ticket prices. Three-day GA passes are up to $375 and three-day VIP passes have climbed to $795. Shuttle passes and parking passes, meanwhile, will be sold for $48 and $255, respectively. And though the festival makes no mention of it yet, single-day tickets are usually sold at a later time. UPDATE (June 6th): Outside Lands has unveiled its daily lineups for 2017, and not to pat ourselves on the back, but our predictions for which days the festival’s headliners would perform were right on point, with Gorillaz performing Friday, Metallica storming the stage Saturday and The Who closing things down Sunday. Check out the daily schedules below before single-day tickets go on sale this Thursday, June 8th at 10 a.m. PT. UPDATE (July 31st): Outside Lands has announced that Queens of the Stone Age, after all, will not perform this year “due to injury” and have been replaced by Cage the Elephant. No details on the “injury” have been released at this time. UPDATE (August 1st): The festival has revealed the schedule for its 10th edition. Take a peek here and start mapping out who you’ll be seeing at Golden Gate Park. Can’t wait for Outside Lands’ 10th edition? Check out our coverage from 2016 here.